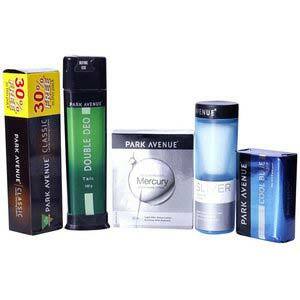 Park Avenue Men's grooming set carries all those daily grooming essentials for men . Park Avenue After Shave Lotion (50 ml 1 N) - It nourishes and refreshes your skin with its aloevera extracts and the aroma for an energetic start to the day. Park Avenue Shaving Cream (70 g 28 g 1 N) - Its unique formula enriched with skin moisturizers helps you produce a thick rich lather and protects your skin from razor burns. Park Avenue Shaving Brush (1 N). It has super-soft nylon bristles with tipping technology which helps spreads the lather better for a smooth and easy shave. Park Avenue Deo Talc (100 g 1 N) - Feel freshness all around you with the Park Avenue Deo Talc. Its antimicrobial agents fight off body odor keeping you fresh all day long. Toilet Soap (125 g (when packed) 1 N) - Now stay cool and fresh. Fight off body odour and feel hydrated. All with the new range of soaps from Park Avenue. FREE! TRAVEL POUCH, Now get a stylish Travel Pouch absolutely free with the 'Park Avenue Essentials Kit'. Note : Colors & Prints may vary from actual photo.